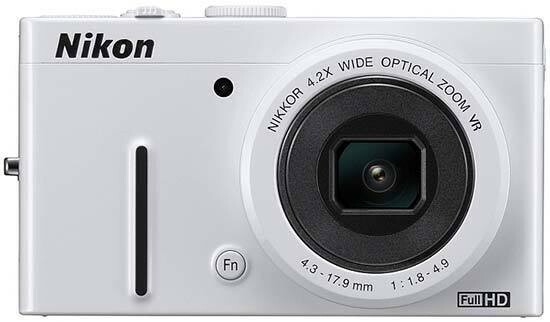 The Nikon Coolpix P310 is a new pocket compact camera designed to appeal to the keen enthusiast photographer. The Nikon P310 has a 4.2x optical zoom with a focal range of 24-100mm, maximum apertures of f/1.8-4.9 and lens-shift Vibration Reduction. The P310 boasts a sensitivity range of ISO 160 to 6400, creative PASM shooting modes, full 1080p HD video recording with stereo sound and slow and fast motion movies, a burst mode of 5 continuous shots at 6 frames per second, 99-point autofocus system and a 3-inch 920,000-dot LCD screen. The Nikon Coolpix P310 is available in black or white for £299.99 / $329.95 / €354.00. The Nikon Coolpix P310 is virtually identical to its predecessor, the P300, in terms of its external design and looks, with the main change being the addition of a Function button to the front of the camera. You can easily carry the P310 around in a trouser or shirt pocket, as it measures 103.0 x 58.3 x 32.0 mm and weighs less than 200g with the battery and memory card fitted. The P310 is marginally bigger than the Canon PowerShot S100, but quite a bit smaller than the Panasonic Lumix LX5 and the Olympus XZ-1, although all of these models are still eminently pocketable. The P310 has a 4.2x zoom lens with a versatile focal range of 24-100mm, more than wide enough for sweeping landscapes yet still offering enough reach for head and shoulder portraits. The lens has a headline-grabbing maximum aperture of f/1.8 at the wide-angle setting, but this quickly drops off as you move through the focal range, reaching a disappointingly slow aperture of F/4.9 at 100mm, which prevents nicely blurred backgrounds from being recorded at the longer telephoto settings. Also note that because of the smaller 1/2.3" sensor, the size employed by the vast majority of compacts, the P310 doesn't blur the background as much as the Olympus XZ-1 at the same aperture of F/1.8, although it does deliver good results for a "regular" compact. The P310 feels quite solidly constructed yet at the same time lightweight, with a magnesium alloy chassis and similarly high levels of build quality that you find on Nikon's more expensive cameras. The front of the Nikon Coolpix P310 features the aforementioned 4.2x zoom lens. Nikon have included their VR (Vibration Reduction) image stabilisation system to help prevent camera-shake, an increasingly de-facto feature on a lot of high-end compact cameras. Annoyingly there isn't a dedicated button to turn it on and off (it's somewhat buried in the Setup menu). In practice I found that the VR system makes a noticeable difference to the sharpness of the images, as shown in the examples on the Image Quality page. You don't notice that the camera is actually doing anything different when anti-shake is turned on, just that you can use slower shutter speeds than normal and still take sharp photos. It didn't seem to adversely affect the battery life either, which is around 230 shots, so I'd advise you to turn it on and then forget about it. Top-left of the lens is a single bulb which doubles-up as the self timer and the AF assist lamp. Also on the front of the P310 is a small but helpful vertical rubber strip that acts as a handgrip for your right hand, with enough room for two fingers. Used in conjunction with the similarly textured thumb-grip on the rear, it allows you to get a secure grip the camera and be able to confidently use it one-handed. The Function button is a new and helpful addition to the front of the P310. This is a customisable button that can be set to one of seven key camera settings, although in the absence of a dedicated ISO control on the rest of the camera, we'd strongly suggest that you set it to this. 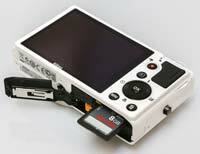 Maximum resolution JPEGS are stored by the Nikon Coolpix P310 in a couple of seconds. In continuous shooting mode it can capture 6 frames per second when shooting Fine sized JPEGs, albeit only for 5 images, so you can never actually achieve the headline rate in practice in terms of the number of shots that are taken. There's also a slower rate of to 30 full-resolution shots at 1 fps. Disappointingly the P310 still doesn't support the RAW file format, something that all of its main competitors offer, and a prosumer feature that frankly we'd expect on this class of camera. The P310 has a small and neat built-in flash, activated by a switch on the side of the camera, which pops-up above-right of the lens and therefore provides a little more clearance and less chance of unwanted red-eye in your photos. We found that the built-in flash unit was fine for a bit of fill-in, with respectably quick recycle times and adequate range. Also located on top of the P310 are left and right microphones for the stereo sound, then a Shooting mode dial, similar to what you'd find on a consumer-level DSLR. Ranged around this are settings for the Auto, Program Auto, Shutter Priority, Aperture Priority and Manual, plus the Night Landscape and Scene modes. New to the P310 is the U option, which stands for User Settings. This allows you to access a saved menu settings configuration, allowing you to quickly swap between the camera's current settings and a preconfigured one. The action of the dial itself is slightly stiff, meaning that you reach each chosen setting with a definite click and avoid accidentally shooting past the one that you wanted. In the Backlighting mode, the P310 captures three consecutive shots at varying exposures and combines them into a single photo with a broader range of tones. Three different HDR settings are available for selection. When the Night Landscape scene mode is selected, the P310 takes several shots at a fast shutter speed and then combines them to create a single optimized photo, allowing you to shoot after dark without having to use a tripod. The Easy Panorama scene mode allows you to take vertical or horizontal panorama photos simply by moving the camera in the direction of the on-screen guides. Multiple shots are then combined into a single panorama photo. The angle of view can be selected from 180° (normal) and 360° (wide). The 3D shooting mode combines two images taken from different positions to create a 3D image that can be played back on 3D TVs and computers. The P310 has a slightly springy shutter button, with the camera taking about 1/4 second to determine focus and exposure but with no discernible shutter delay thereafter. This is surrounded by a pleasingly tactile zoom lever. The zoom is pretty quick to respond, sound-tracked by a mechanical gnat-like buzz. Just behind the shutter release button is an annoyingly small but clearly marked on/off button, within which a a green LED briefly lights up to signify the power is indeed on. Give it a press and the P310 powers up very quickly in around 1/2 second, the lens barrel extending to maximum wide-angle setting and the rear LCD blinking into life. Completing the P310's top-plate is a rather clever feature, a large, unmarked, thumb-operated dial for setting the shutter speed when the shooting mode is set to Shutter Speed Priority or Manual, or alternatively for setting the exposure compensation. We'd have welcomed the ability to customise its use, though - it would be nice to be able to set the aperture this way, for example, as the navigation wheel on the rear that does change this setting has a nice action but isn't as intuitive for anyone who has used a DSLR before. Still, dual controls for setting the aperture and shutter speed is very rare on any compact, so kudos to Nikon for including both on the P310. The rear of the P310 has a 3-inch LCD screen with an impressively high 921,000-dot resolution, providing more than enough detail for you to be able to determine whether you have a sufficiently crisp image. To the right is a tiny flash recycling lamp and underneath that a handy one-touch movie recording button. The Nikon Coolpix P310 can record full 1080p, 1920x1080 pixel HD movies at 30fps with stereo sound and full use of the optical zoom. It also offers a 720p mode at 1280x720 pixels (30 fps) and VGA mode at 640x480 pixels (30 fps). In addition there's a special High Speed mode which records at 15/60/120 fps (no sound) that can be played back in slow motion at 1/4 or 1/2 of the normal playback speed or in fast motion at twice the normal playback speed. The Creative Slider and Special Effects can also be used when shooting movies, and they can be played back on a HDTV via the built-in HDMI connector, although as usual there's no suitable cable supplied in the box. The P310 supports the CEC feature for HDMI which enables playback control using your TV's remote control. Underneath the movie button is the self-explanatory playback button. Irritatingly there's no external button for controlling the screen display, just a menu option, and there's also no live histogram either (although the OK button does call one up in playback mode). Next is the familiar four-way navigation pad, which allows you to set the flash, exposure compensation, macro and self-timer options, in addition to moving through menus and selecting options, with an 'OK' button at its centre being the means via which changes can be implemented. Surrounding this is a circular wheel, a feature that has been "inspired", shall we say, by some of Nikon's main rivals. As previously mentioned, this is principally used to set the aperture, forming an intuitive partnership with the thumb-controlled dial, as well as performing the more mundane tasks of moving through menus and selecting options. 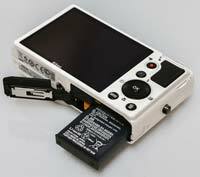 The Nikon Coolpix P310's familiar Menu button accesses the usual Nikon menu system, which is clear and easy to navigate. Press this when in any of the shooting modes and there are three menus, Shooting, Movie and Set Up, with two menus, Playback and Settings, available when you're reviewing an image. A big oversight is the almost constant need to use the menu system for setting the ISO speed, white balance, metering, AF mode and continuous shooting, with at least 4 button presses required to change these often-used features, although the new Function button does partially address this problem by providing quick access to one key function. In playback mode, pressing the same Menu button affords access to image editing options including Nikon's exposure adjusting D-Lighting function, Skin Softening and Filter Effects, image slide shows, and the automatic Quick Retouch. A button to the right features the familiar trashcan icon for deleting images on the fly and completes the rear of the P310. On the right flank of the camera - still viewing it from the rear - there's a metal eyelet for attaching the supplied shoulder strap and a plastic cover protecting the HDMI port. On the left hand flank is the release button for the pop-up flash. There's a centrally positioned, metal tripod mount on the bottom of the camera. The P310 is powered by a 1050 mAh lithium ion battery, good for around 230 shots, that slots into the base alongside the SD / SDHC / SDXC card slot and the the A/V out / USB port. Note that recharging the P310 is a somewhat convoluted affair, with the battery remaining in camera and requiring the battery cover to be closed.